A 1-day visit to the British Library in December 1993 prepared for the Research Group’s January 1994 workshop on optical imaging techniques as aids for manuscript studies. 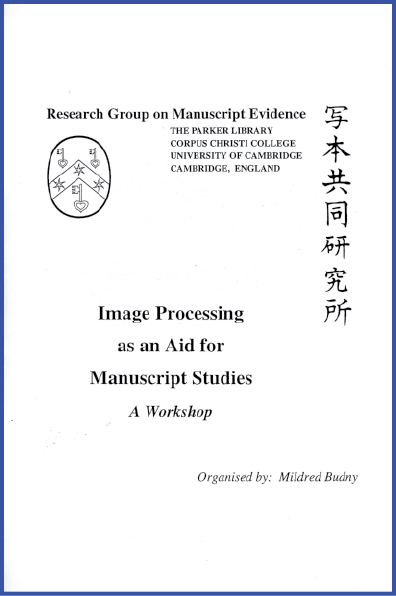 Organised by Mildred Budny and Tony Parker and held at the Parker Library, that approaching workshop on Image-Processing for Manuscript Studies” aimed to consider developments in imaging through photographic and computerised methods, as a means of gathering information and feedback about techniques of image processing, both existing and planned, with a view toward applications, capabilities, limitations, desiderata, and future potential. Participants at the workshop would include experts in manuscript studies, conservation, photography, imaging aids, computing, radio astronomy, engineering, forensics and medical imaging. The speakers would come from the Research Group on Manuscript Evidence, the University of Cambridge, the British Library, the University of Kentucky, the Questioned Documents Section of the Metropolitan Police Forensics Laboratory, Ipswich Hospital, and Keith & Pelling Ltd. The other participants would come from both near and far. Meanwhile, there were elements of information to gather and materials to prepare. Viewing the Front of The British Museum via Postcard. The Visit took place in the Manuscripts Conservation Studio of the Collection and Preservation Directorate of The British Library. At the time, remember, The British Library (created on 1 July 1972 as a result of the British Library Act 1973) still remained in its “old” building, before the move in 1999 to the new building, specially built for the purpose, on the Euston Road, Number 96. That is, the British Library remained in the same building as The British Museum, out of which it had emerged as an entity of its own. The Department of Western Manuscripts remained in its domicile, in the East Wing of the building (designed in Greek Revival Style by Sir Robert Smirke and completed in 1852), facing Great Russell Street and the Front Entrance. The Manuscripts Conservation Studio occupied quarters in the Basement below. 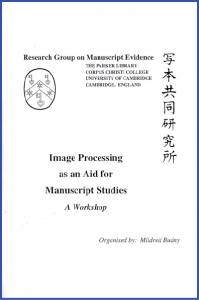 During the years of her long-term research on manuscripts at The British Library for the Ph.D. (London 1984), Mildred Budny (a founder member and by now Director of the Research Group on Manuscript Evidence) had been a frequent visitor to the Manuscripts Conservation Studio, at Tony Parker’s invitation, to learn about new equipment, new techniques, and new discoveries as part of the conservation work on many forms of materials, manuscript and other. 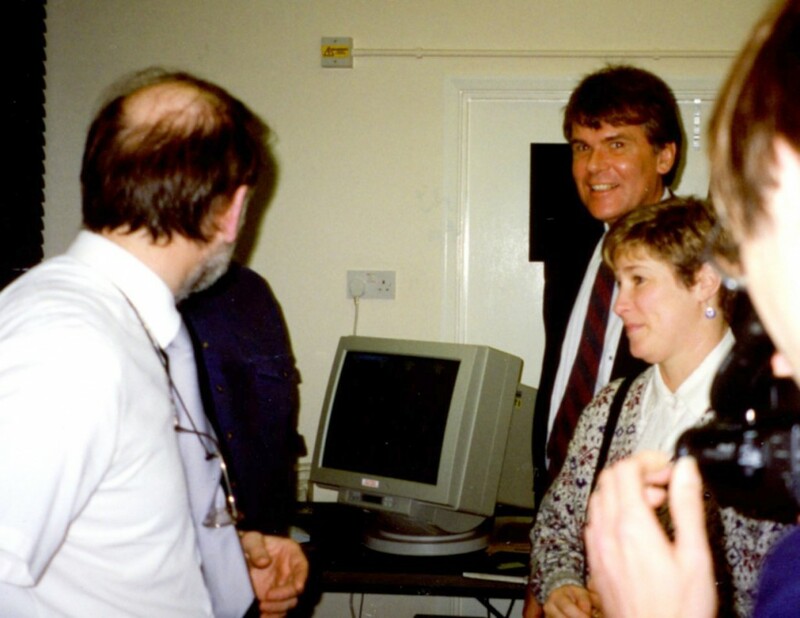 As a result both of such visits and meetings elsewhere, conferences included, it was “natural” to learn, for example, about the Beowulf Digitisation Project (1992–) already as it was beginning to take shape and form. © The British Library Board. Cotton MS Vitellius A XV folio 132r. Reproduced by permission. © The British Library Board. Cotton MS Vitellius A XV folio 140r. Reproduced by permission. © The British Library Board. Cotton MS Vitellius A XV folio 163v. Reproduced by permission. © The British Library Board. Cotton MS Vitellius A XV folio 139r. Reproduced by permission. ‘Imaging Aids’ on 15 December 1993. Photography © Mildred Budny. A report of this December Visit appears as an Appendix to the “Preliminary Report” of the 15 January Workshop, printed and circulated as a Booklet after its event. A similar Report for the December Visit to the British Library appears in the Fifth, and Final, Annual Report to the Leverhulme Trust (1993–4) on the 5-year Research Project at The Parker Library on “The Archaeology of Anglo-Saxon Manuscripts” (Leverhulme Trust ref. F665). On the series of Annual Reports, see our Publications. We now transcribe the Report here, for you to see both on our website and in our Research Group font Bembino — our own copyright font, designed over more recent years by one of the participants of this Visit. (You may download this font for FREE here.) 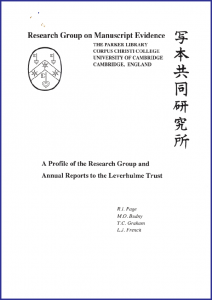 You may also view the Appendix on its original page in the downloadable Booklet. Here, we add some links and, by permission from The British Library, several images from the relevant manuscripts examined during the Visit. © The British Library Board, Cotton MS Vitellius A. XV, folio 147r. Reproduced by permission. “Organised by Dr Budny and Mr Parker, a Research Group visit to the British Library took place in December, in preparation for the workshop at the Parker Library in January. The meeting was attended by Dr French, Dr S.L. Keefer (Trent University, Ontario) and Mr R.M.Keefer (consultant specialist to the Alcan corporation, Canada). 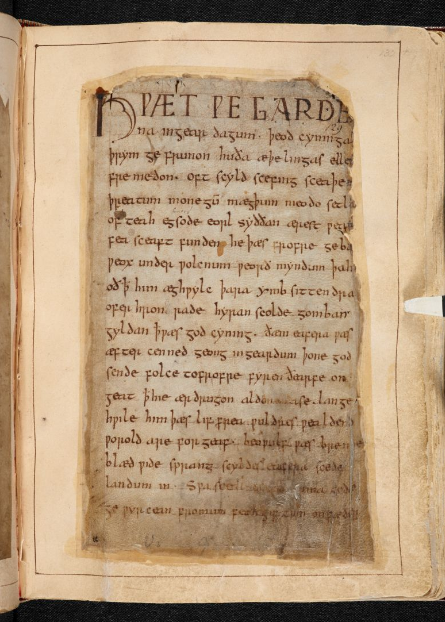 “Dr Prescott demonstrated developments in the new Digitisation Project at the British Library devoted to the Beowulf manuscript. Mr Parker surveyed the history, development, range and uses of advanced viewing aids in the Manuscripts Conservation Studio of the Collection and Preservation Directorate of the British Library, notably as applied to the Western Manuscript collection since the early 1970s. Mr Parker demonstrated uses of microscopy, borescopy, infrared and ultra-violet lighting, fibre-optic lighting and the Video Spectral Comparator (VSC), with examples from British Library materials. 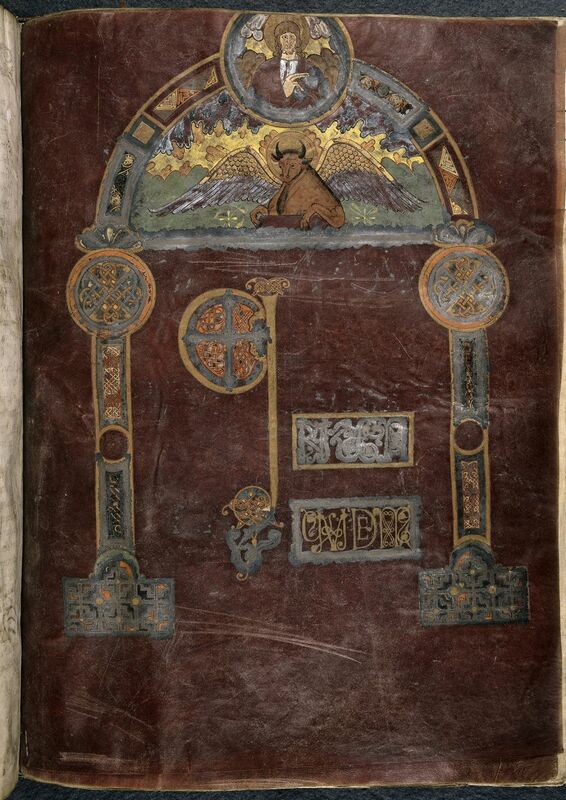 Saint Dunstan’s Classbook, MS. Auct. F. 4. 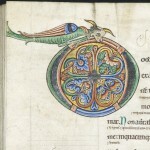 32, folio 1r, tenth century. Photo: © Bodleian Library, University of Oxford (2015). As for this “specimen” page in Cotton MS Claudius A.iii, which depicts the full-length enthroned figure of Pope Gregory the Great (plus inspiring dove) with an ecclesiastic and 2 monks at his feet, and which includes a revised inscription naming Dunstan at the top in lighter ink and thinner strokes written with a different pen (and hand), there gather several questions regarding the layers and the pigments — not least, the thickly painted black habit of the lowermost monk. Invading its space (like some other parts of the scene), he seems to overpower the polychrome inhabited scrolling foliage which fills the rectangular frame for the frontispiece. Might he, or his black pigment, constitute an addition to the frontispiece? 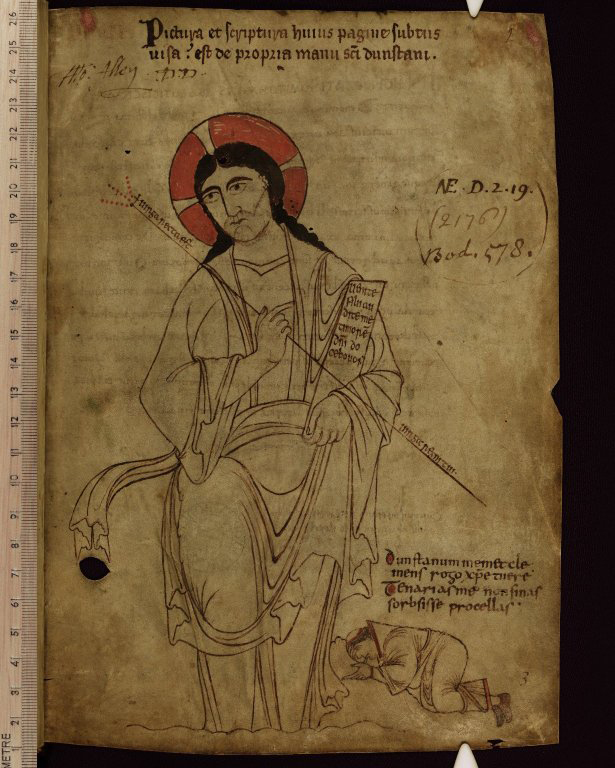 If so, it wouldn’t be the first time for an image which includes, or which an addition to the page asserts that it includes, a representation of Dunstan. 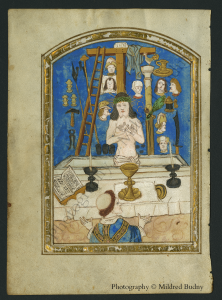 For such, as forensic analysis had already established, constitutes the complexly layered frontispiece of Saint Dunstan’s so-called Classbook, a chief treasure of the Bodleian Library. Except that in the Classbook Case, the inscription identifying as Dunstan (in the first person, no less) the “portrait” of a reverential monk facing an imposing figure (a monumental Appearing Christ) is apparently the work of Dunstan himself, along with a few added elements (retouches of sorts) for the frontispiece drawing in red pigment. In that case, the “portrait” would be contemporary, whereas, in the Gregorian Case, it belongs to a later date and, it seems, to a center at which Dunstan came to hold sway as the culmination of his career. 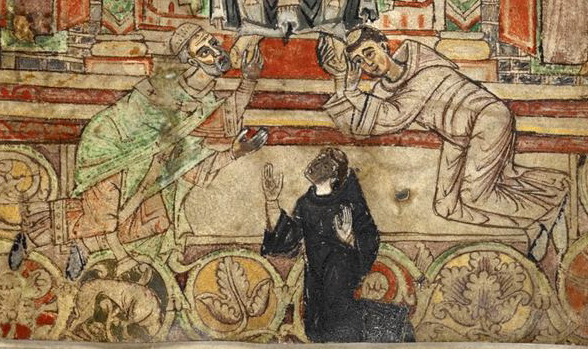 Perhaps the image copies or takes inspiration from an illustration dating to his own time, whether during his function as monk, as abbot, or as archbishop? Further research may illuminate the sequence of transmission. Meanwhile, the visit to the Manuscript Conservation Studio provided some forensic evidence regarding the frontispiece in Cotton MS Claudius A.iii itself. © The British Library Board. 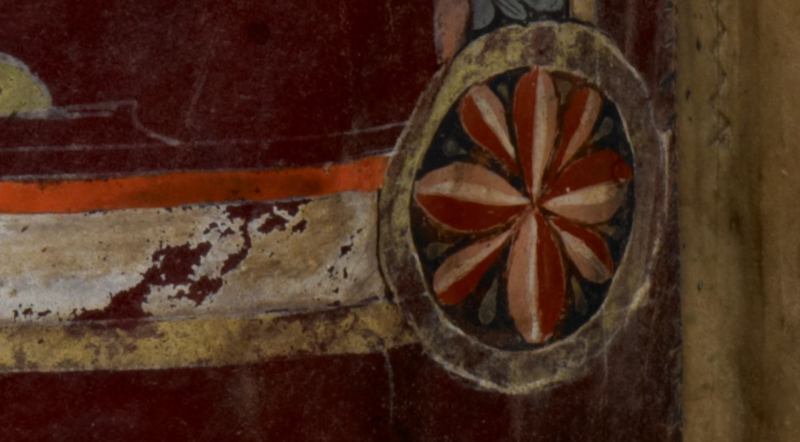 Cotton MS Claudius A III, folio 8r, top. Reproduced by permission. © The British Library Board. Cotton MS Claudius A III, folio 8r, bottom. Reproduced by permission. © The British Library Board. Cotton MS Claudius A III, folio 8r, middle. Reproduced by permission. All but Richard Keefer are members or Associates of the Research Group on Manuscript Evidence; he is married to one of them, and has participated in our conversations over several years about imaging issues as the Research Group was taking shape and form. The visit to the Manuscripts Conservation Studio functioned both as a form of gathering and updating information about current techniques and their applications, in the sphere of manuscript studies and beyond, and as a way of preparing photographic materials and conducting research on selected passages for the January Workshop on “Image-Processing”. © The British Library Board. Cotton MS Vitellius A XV folio 142r. Reproduced by permission. Most of the participants in the December Workshop gave presentations, including elements, techniques, and discoveries of that workshop. 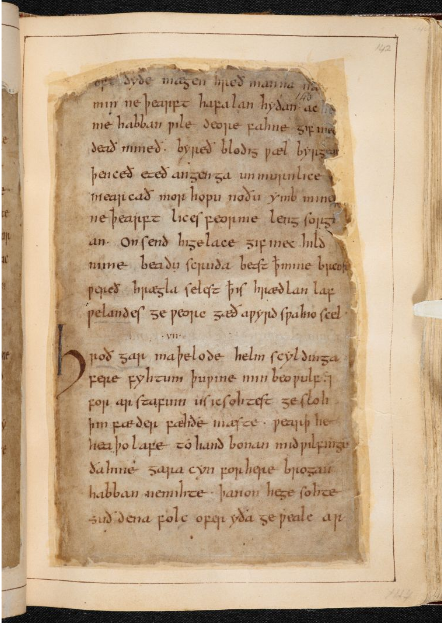 Digital Beowulf included. As Part I in a series, Mildred Budny reflects on recognizing the familial connections of ‘orphans’ among dispersed manuscript leaves. Part II considers a group of them as ‘Lost and Foundlings’. ‘Do the right thing’, we often hear. Yes, presumably, that seems worthwhile, given the chance, ability, or will. But how to do it and what to do? Doing the Right Thing for Historical Records? Hmm. Preserving artefacts and monuments from the past is not always straightforward, nor always deemed desirable. The issues remain subject to controversy and concern. When it comes to old manuscripts and their fragments, the set of choices could depend upon opportunities, determination, and intention, as well as, on occasion, serendipity. 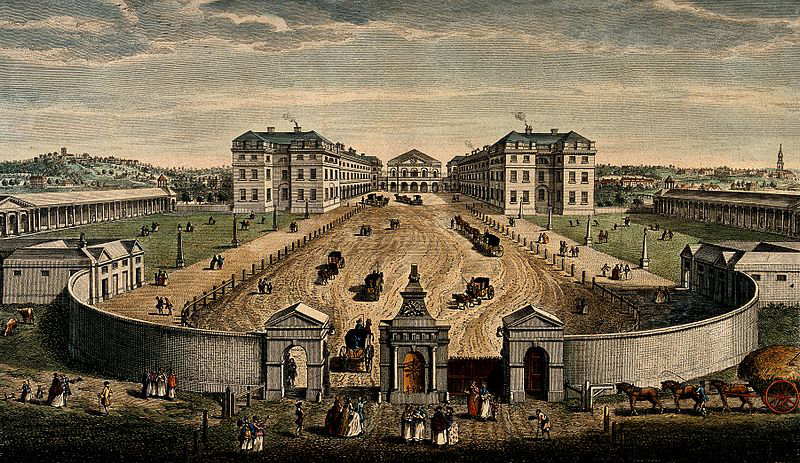 Recently I have been thinking about the humanitarian purpose and activities of the 18th-century foundation of the Foundling Hospital, whose grounds I used to visit during my long postgraduate years in London. Now my thoughts focus on that place, and its place in history, not only in its own right, but as a metaphor or model for the challenges and opportunities in gathering together the orphans, waifs, and strays among despoiled manuscripts and books of earlier ages. These reflections have come to mind as I work to shape the illustrated Handlist of a group of medieval and early modern manuscript fragments and documents, plus some early printed materials, which I have had the opportunity to photograph, conserve, and study for some time (as reported, for example, on this website and in a close-up). By its owner’s wishes, for now the group is called an ‘Assemblage’ because its group was assembled over decades less specifically or purposefully than a ‘Collection’ as such might imply. Recently, during the accelerated course of the work on the materials as a group, there has appeared the poignant illustrated blogpost by Erik Kwaakel showcasing a group of handwritten tags intended to identify, and to accompany, children who passed through the Holy Spirit Orphanage (Heilige Geest- of Arme Wees- en Kinderhuis in Dutch) in Leiden in The Netherlands in the 15th century. These brief slips can or must stand now for their bearers, long gone into the past, perhaps with little or no other written record for their living existence. Manuscripts and Foundlings: somehow they interrelate. Manuscripts as Foundlings, and Human Foundlings with Manuscript Tags. Poignant predicaments, and poignant traces. It seems a mercy that any traces may remain to bear witness to the lives, and also the books which any lives have produced, owned, read, perhaps enjoyed, and lost. The time has come for finding, and for caring. Although few in number, the fragments in the Handlist come from a varied range of types of texts, dates and places of origin, and modes of descent into modern times — not least through their dismembered reuse as binding materials of several kinds or for individual display as specimens of script, decoration, or illustration. Mostly they comprise single leaves (folia), pairs of conjoined leaves (folded bifolia), or scraps. Mostly they come with few, if any, indications of either their former ‘families’ within their original volumes and their former ‘homes’ in libraries or collections, or the identity of their despoilers. That is, apart from the clues which they carry upon their very surfaces or on materials which may have migrated with them, whether by chance or by design. Those indicators, written or unwritten, may reveal their testimony principally in connection with the evidence preserved in other materials in other collections, provided that researchers might find it or learn about it. 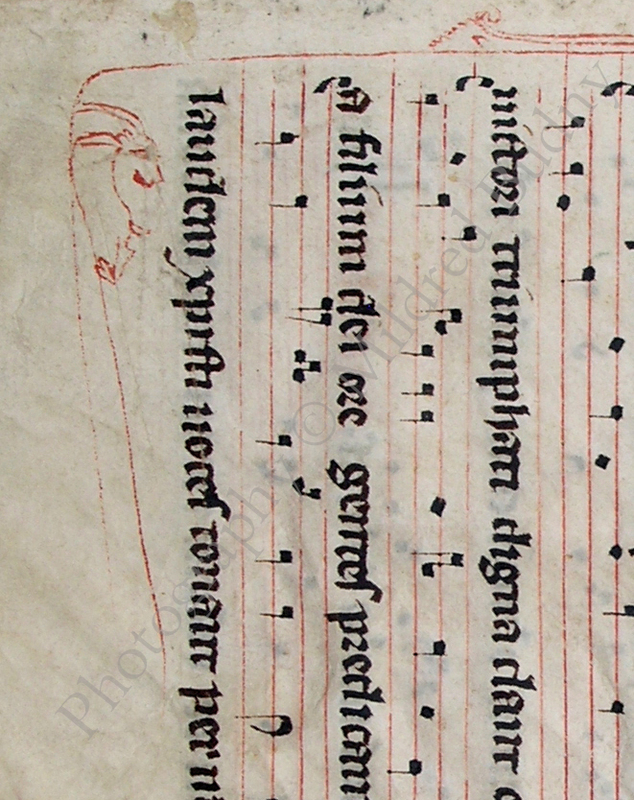 We have described and illustrated the interim results for one of the Handlist items recently (‘Handlist 13’, shown here), a detached 15th-century leaf with an intricate illustration on its verso of the Mass of Saint Gregory the Great, at which the celebrant of the Mass experiences a vision of Christ surrounded by the Instruments and Agents of the Passion. 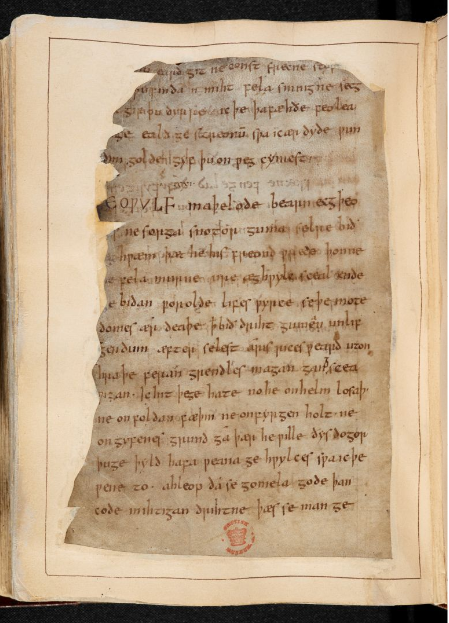 The widespread dispersal, across the centuries and even — alas — nowadays, of scraps, leaves, or bits of manuscripts without regard, usually, to their complete original context within a whole manuscript, collection, or body of work by their given creator(s) can give rise to mixed feelings. The degree of mixture may depend upon the circumstances of dispersal or the disposition of the viewer, in various measures. On the one hand, the phenomenon constitutes a trashing of cultural heritage to be deplored. On the other, we might have some slender sense of relief that something, at least, has remained, if only by the skin of its teeth. Following that toothy metaphor, we might lament or marvel, by turns or in combination, that any traces whatsoever might remain of past achievements, however down in the tooth, toothless, or plagued with perhaps ill-fitting artificial teeth they might now be. Let’s chew on that. 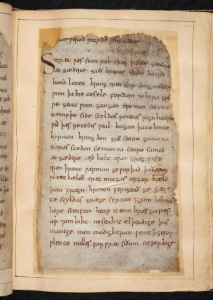 In recent years, much attention in medieval manuscript studies (for example) has considered the despoliation, usually willful, of whole manuscripts so as to extract the juicy bits, such as illustrations, decoration, and choice specimens of script. Mostly without bothering to record their context and companions. Such practices have occurred across the centuries in many situations and for varied purposes, sometimes laudable. 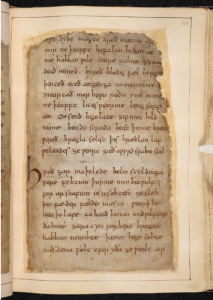 Years ago, in embarking on manuscript studies in earnest as a graduate student at University College London, I encountered this tendency, at a safe distance removed by centuries, in deciphering the evidence of the remnants of a superb manuscript made in the 9th century C.E. at St. Augustine’s Abbey, Canterbury. The manuscript contained a large-format copy of the full Vulgate Bible in Latin, with some prefatory texts and illustrations.Its remaining treasures include some richly purple-dyed leaves with full-page monumental inscriptions in gold and silver lettering and the majestic opening to the Gospel of Luke, which enshrines the intricately decorated opening words Quoniam quidem (‘Foreasmuch as’) within a full-page arcade with panels of ornamental interlace, geometrical, foliate, and animal patterns and with the half-length figures of both the evangelist’s symbol (a winged bull) and Christ holding books and appearing within heavenly clouds. 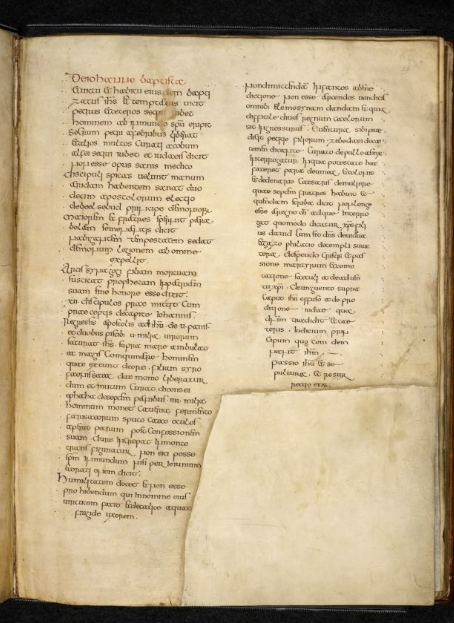 That monument, whose remnants survive mostly in London, British Library, Royal MS 1 E.vi, formed the subject of a detailed, holistic study, entitled ‘British Library Manuscript Royal 1 E. VI: The Anatomy of an Anglo-Saxon Bible Fragment’ (London, 1984), available freely online. Further discoveries about the manuscript and its astonishing Late-Antique model, the now-lost Biblia Gregoriana of the abbey, are reported here. The process, progress, and discoveries of this cumulative work, demonstrating the value of a detailed, holistic study integrating multiple forms of evidence and fields of expertise, helped to lead to the formation and practices of the Research Group on Manuscript Evidence. 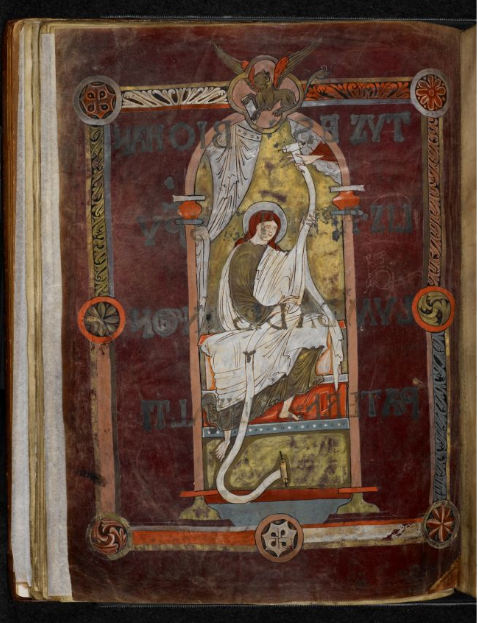 Such fruits appear, for example, in the largest co-publication to date of the Research Group: the 2-volume Illustrated Catalogue of Insular, Anglo-Saxon, and Early Anglo-Norman Manuscript Art at Corpus Christi College, Cambridge. 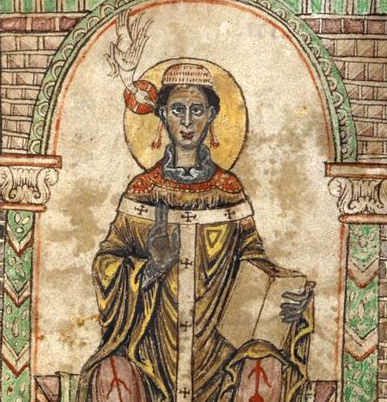 Why the medieval abbey — one of the principal centers of book-production in England — which had created so splendid a manuscript as the Royal Bible would choose to strip it of samples of illustrations and exemplary script within a mere two centuries of its creation (as the evidence establishes) remains a mystery, although there are some possible explanations. Explanations are not necessarily tenable justifications, of course. and perhaps more sorts of elements. Some of those removed leaves or parts of leaves left offsets of their pigments on the pages which they formerly faced. Such are the case, for example, with the concluding title for the Mark chapter list and both the titulus and opening page for John. Sometimes the removed portion introduced a gap within a leaf or at a lower corner of a leaf left behind. 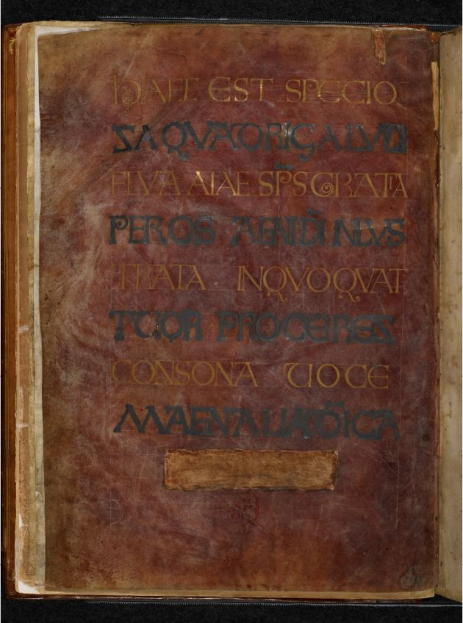 They occurred in excising specimens of elaborate script from it: taking the last line, in gold, from the descriptive titulus for the frontispiece to the Gospels (folio 1) and the elaborate concluding titles for the Mark and John chapter lists (folios 29 and 68). The gaps were replaced with patches of parchment pasted onto the bare backs of the leaves. For a purple leaf, the patch was colored, somewhat inefficiently, with a pigment that has now faded to brown. The cutting lines along part or all of some leaves adjacent to fully excised leaves, resulting from the slits of the knife drawn along the inner margin of the book, as the plunderer faced the wanted page, have been stitched together in a set of repairs following the spoliation and, it seems, following the retrieval of some of the fully severed leaves. For example, the leaf with the titulus for the Mark Gospel frontispiece (now folio 30) was completely severed, but it was resewn to its resulting ‘stub’. The following leaf received the same treatments, that is, severance by knife followed by reconnection with needle and thread. © The British Library Board, Royal MS 1 E vi, folio 30v, detail. Reproduced by permission. 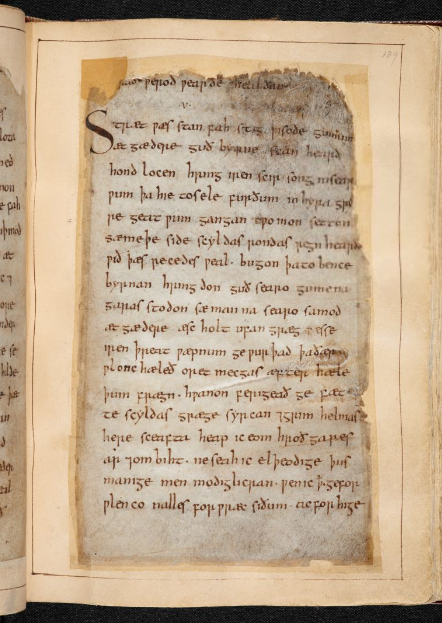 That this spoliation occurred by the mid-11th century or so is established by the white pigment overlay and overflow onto one of those stitching lines, along the inner margin of verso of that leaf which carries the Mark titulus on its recto. The overlying pigment belongs to the added frontispiece on the verso, which provides a framed frontispiece in a different style and with a different structure. In outlining the roundel at the bottom right of the paneled rectangular frame, the brush caught onto the repairing stitch, which tugged part of its tip and dragged some of the pigment, leaving the track which establishes the sequence of accretions. First came the cuts to excise leaves and parts of leaves. There followed the repairs to stitch some severed parts back into the book. Then came the addition of the painted frontispiece for the Mark Gospel, perhaps in an effort to refurbish the book, replace the lost Mark frontispiece in a new style, and/or try out an approach to painting on a purple-dyed leaf on an available expanse. the added frontispieces in the Corpus Eremetical Saints’ Lives. Within the Royal Bible, in applying an outline of white pigment to the border roundel at the lower right-hand corner of the frame, his brush caught onto the stitching repair and left its traces there. Caught in the act. 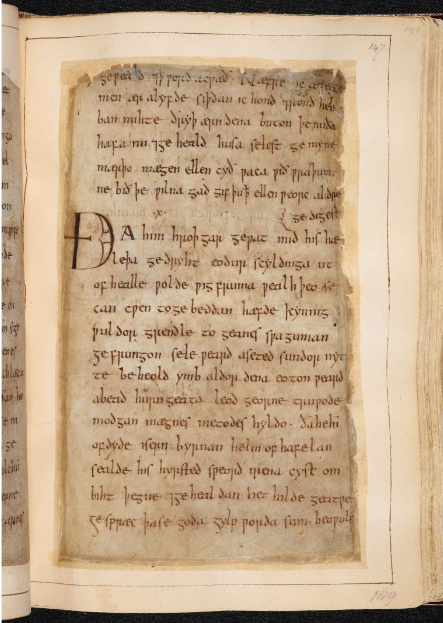 By the late Middle Ages, the manuscript had lost many more of its leaves — while still at the abbey — for reuse as binding material for other texts. 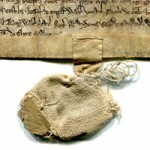 Two of those reused leaves have surfaced at Canterbury Cathedral (as a folder for some unknown materials, removed from them without record in the 19th century) and in the Bodleian Library in Oxford (as a folded pair of endleaves for a 10th-century manuscript, removed from it in the 19th century). This form of despoilation of leaves for reuse in binding texts of other kinds occurred apparently by the 14th century. The forms of evidence which point to this date-range include the abbey librarian’s inscriptions, entered in stages at the top of one of the flyleaves added to the Royal portion by the 14th century. They provide the library ownership inscription, the library pressmark, and a brief description of the contents as an ‘old’ (vetera) and ‘bare’ or ‘despoiled’ (nuda) copy of the ‘4 Gospels with [the lettermark] A’. 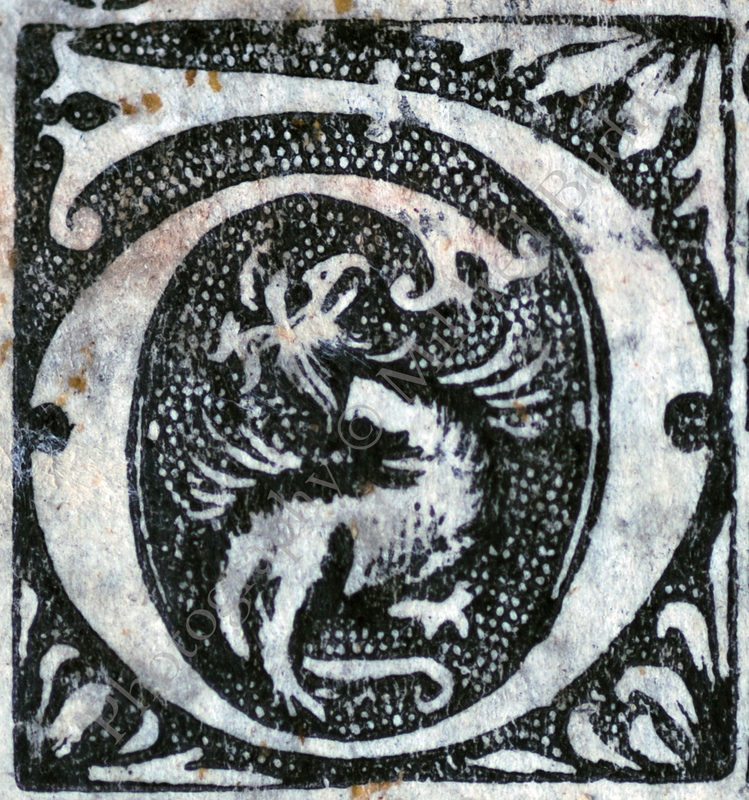 As on other books from the library, the lettermark stood on the binding (now lost in the rebinding at the British Museum in the 18th century). The rough parchment patches on the flyleaves, like the flyleaves themselves, belong to a recognizable stock of parchment leaves used for flyleaves, patches, and other work on the manuscripts in the abbey library during the 14th century. Useful to know. 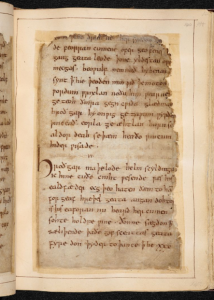 And that knowledge about those tell-tale features of the parchment itself comes from having looked at very many of the many manuscripts which survive from the abbey library and show signs of refurbishment and other forms of alteration during this period (among others). 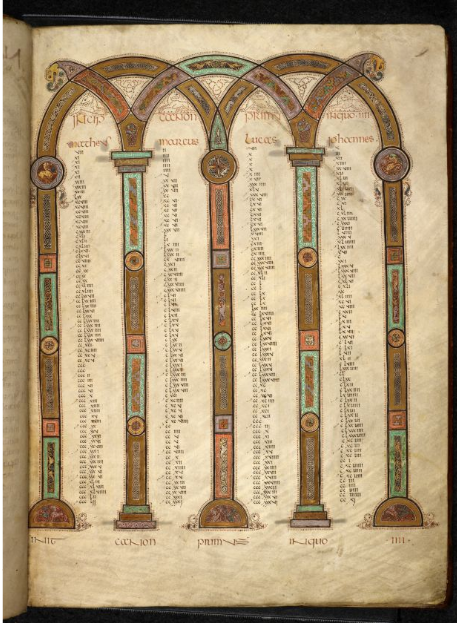 Altogether only 79 leaves remain of more than 1,000 leaves originally, plus the 2 endleaves added in the 14th-century to the front and back of the London portion, then reduced to a fragment of the Gospels. 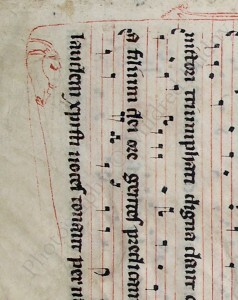 The Canterbury leaf, with its part from the John Gospel, formerly followed the last leaf in the Royal portion directly, as the first leaf of the next quire. Formerly placed at the distance of a few leaves from the Gospel portion, perhaps halfway through the quire after that, the Oxford leaf holds part of the Acts of the Apostles. A small, but significant, remnant. 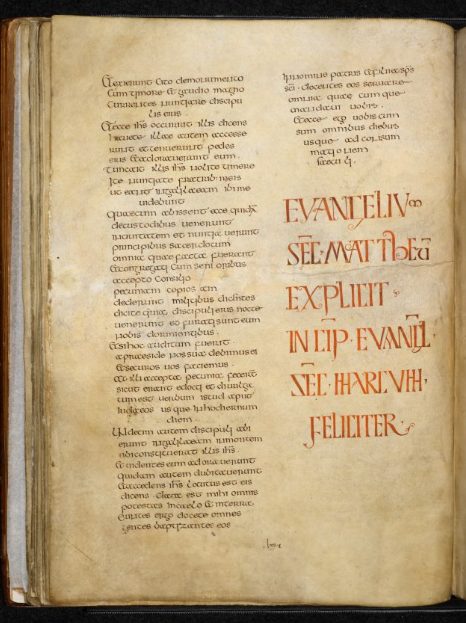 Few full Bibles survive from the Latin West up to the time of this 9th-century Royal Bible, and only one made in England: the early 8th-century Codex Amiatinus, but with fewer illustrations and less magnificent decoration. (No offense to that Bible, an astonishing witness in its own ways.) That somewhat distant relative, from Northumbria, and from the double monasteries of Monkwearmouth–Jarrow, home of the Venerable Bede (who may have had a hand in the production or design), helps to gauge the former stature of the monument, when complete. 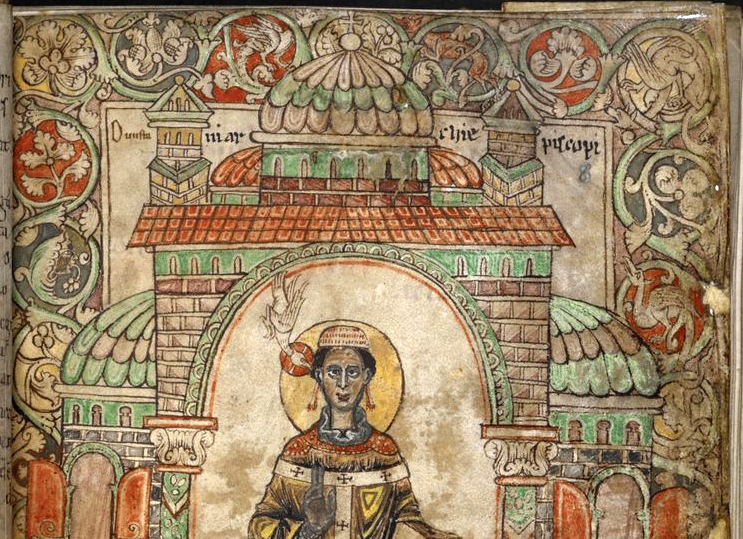 The nearly contemporary Continental competition for our Royal Bible among large-format illustrated Carolingian Bibles or Spanish and other Bibles is another story. 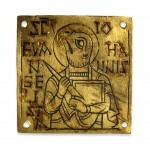 Have a look, for example at one of the earliest. These are big books, worth standing up to view them and, when chance arises, turn their pages. About the Royal Bible, it is worth remembering that the despoiled carcass (shall we say) which remains of that vibrant whole, although dispersed between London (now with online facsimile), Canterbury, and Oxford, continues to bear witness to a former monument of extraordinary magnificence, albeit reduced to the floating tips of a once-weighty and mighty iceberg. 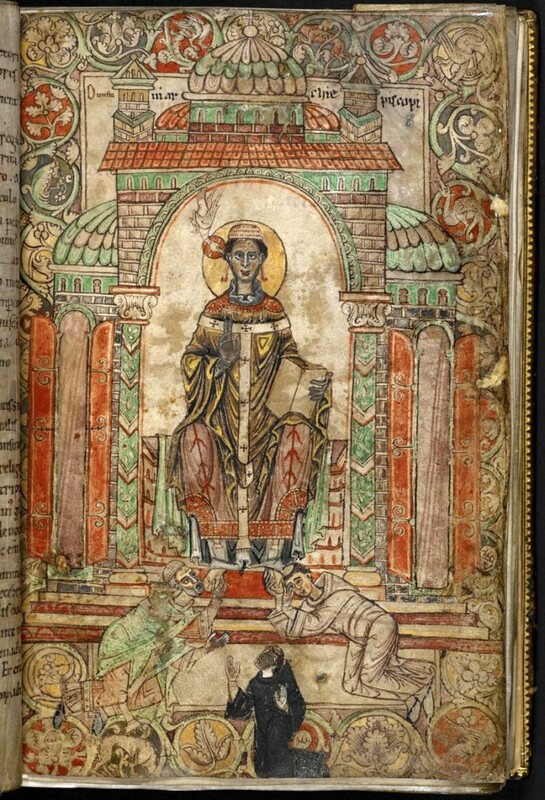 Having worked to identify its significance as a precarious, but vigorous, witness, both to its original monument and to its majestic Late-Antique exemplar, the lost Biblia Gregoriana, I find some solace in the recognition by a sympathetic colleague, Richard Gameson (our Associate), that this 9th-century Royal Bible of St. Augustine’s Abbey, “still majestic despite truncation and mutilation,” might rightly be regarded as “the Ozymandias of early Anglo-Saxon book-production” (Royal Manuscripts: The Genius of Illumination (2011), no. 2). In order words, this fractured, but still magnificent, monument must and can carry the weight of centuries. Fortunate it might be to find the opportunity, after all, to regain some of its eloquence. It is a privilege to spend time in its company, and I continue to remember, with affection, the very many days, months, and years on end of turning its pages, inspecting its details, learning to know its features, reflecting upon its character and contexts, and becoming familiar with its variety, complexity, and beauty as one of the most significant manuscripts of its age. And so now, with this case study freshly in mind, we turn to another group of ‘Lost and Foundlings’ among manuscript fragments, this time from dispersals of books from various centers, periods, types of texts, and styles of medieval book production, in ‘The Case of Otto F. Ege’, selfstyled ‘Biblioclast’. We invite you to have a look, as we unveil some newly recognized fragments among those dispersals. How the different ‘Foundlings’ among manuscript fragments might sometime find a proper, albeit virtual, home so as to acknowledge, to record, and to welcome their familial connections in former whole manuscripts as a form of ‘genealogical recovery’ remains to be determined in the concerted quest in various centers to establish and to foster such projects. While they find their fuller footing, with larger institutional supports, we will turn to the next report on our findings. Next stop: ‘Lost and Foundlings’. We welcome your comments, questions, and feedback. Please leave a comment or Contact Us.